Atrial fibrilliation is a medical condition wherein there is irregular and an abnormally higher heart rate. The normal heart rate is between 60 to 100 beats per minute at rest. The rhythm of the heartbeat is usually regular. In atrial fibrillation, the heartbeat is faster, is more than 140 beats per minute, and is irregular. This can further lead to other problems such as dizziness, shortness of breath, palpitations and fatigue. Atrial fibrillation can bring about symptoms such as a fast and irregular heartbeat (palpitations), usually over 100 beats a minute, tiredness, breathlessness, dizziness and chest pain or angina. There may also be low blood pressure and heart failure. The doctor may suspect that you may have atrial fibrillation if you have a sudden change in your heartbeat, your heart rate is lower than 60 or your heart rate is above 100. 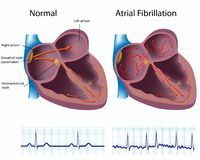 These symptoms of atrial fibrillation are due to the effects of atrial fibrillation on the body. Atrial fibrillation is caused by the fast random contraction of the walls of the upper chambers of the heart. The beating of the heart is so fast that there is no period to relax for the heart. This further reduces the heart's performance and efficiency. Atrial fibrillation is caused by abnormal firing of electrical impulses from the atria. These impulses overpower the natural pacemaker of the heart so that the rhythm of the heart can no longer be controlled. The exact cause of atrial fibrilliation is unknown however it occurs in people with certain medical conditions such as high blood pressure, atherosclerosis, heart valve disease, congenital heart disease, cardiomyopathy and pericarditis. It may also be associated with other diseases such as hyperthyroidism, pneumonia, asthma, chronic obstructive pulmonary disease, lung cancer, diabetes, pulmonary embolism and carbon monoxide poisoning. There are some conditions which can trigger atrial fibrillation in sensitive patients. These triggers include drinking excessive amounts of alcohol, being overweight, drinking lots of caffeine (such as tea, coffee or energy drinks), taking illegal drugs (amphetamines or cocaine) and smoking. If untreated, atrial fibrillation can give rise to strokes. A recent study has shown that stroke can be a consequence of atrial fibrillation. This was discovered when Northwestern Medicine® physician researchers from cardiology and neurology teamed up to conduct a four-year trial which enrolled 441 people across 55 centers. Half of these patients received a small implantable cardiac monitor that continuously records the rhythm of the heart and lets the physician know over the internet when an abnormal rhythm has occurred. The results showed that 30 % of people with cryptogenic stroke have atrial fibrillation detected within 3 years. These 30% were given blood thinners to protect them from another stroke. These research findings were published in a June 26, 2014 article in the New England of Medicine. The patients monitored were part of a study called CRYSTAL AF (Study of Continuous Cardiac Monitoring to Assess Atrial Fibrillation after Cryptogenic Stroke). The researchers found out that the tiny implantable device that they used for finding atrial fibrillation was better than the usual tests that helped diagnose this disorder. More medical breakthroughs can be found on the other articles of this site.